10, 15 & 20 foot standard lifts. Other lifts available. Standard push button drop is 4 feet less than lift. CSA approved. 115/230 – single phase; 230/460, 208, 380, 415, 575 – three phase; 60 hertz standard, 50 hertz available. Panel plate provides easy access to controls and motor leads for changing voltage on dual-voltage motors or servicing the hoist. Connection wires are numbered to assist with maintenance. Multiple disc motor brake with direct acting design for positive load spotting and holding. 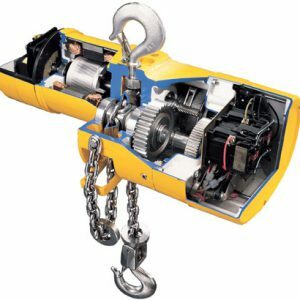 5-pocket load sheave increases chain and sheave engagement 25% over hoists with conventional 4-pocket sheaves. Provides smoother lifting and reduces chain wear. Regulate upper and lower load travel. Brass nuts standard for improved switch setting and repeatability. Stainless steel limit switch shaft standard. 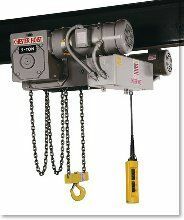 Mechanical overload protection device protects hoist, operator and supporting structures from damaging overloads, chain jamming, and reverse phasing. Optional with 3:1 speed ratio, 3-phase, single voltage only. Oil bath transmission and precision machined alloy steel gears for longer, quieter operation. Ergonomic design fits operator’s hand for thumb or two-handed operation standard. 24V Control for operator safety. 115V Control available upon request. Housing designed for portability and ease of installation. 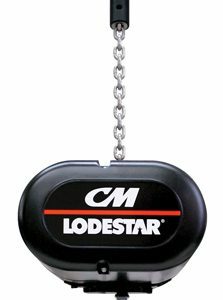 Durable chain container is standard on lifts up to 20 ft. single chain and 10 ft. double chain. Variable frequency drive option is available in U.S. only. * Rigid top hook standard. Specify rigid lug, if desired. (Max flange width for JLCET is 8"", JLCMT is 9"") For JLC with geared trolley - consult factory. ** Standard trolley speeds are 35 & 75 FPM. Optional speeds available, consul factory. Specify speed when ordering.